Did my horse step on my foot on purpose? “Yesterday my horse stepped on my foot! No LOL; it hurt. Afterward, I decided maybe my horse was being disrespectful??? She knows where she’s putting her feet. If she had a foal, would she step on it? She was squirmy when I put the saddle on, (I can’t remember her stepping on me before this.) and she stepped on my foot with her hind foot as I tried to steady her. I’m not sure if I might have turned her head slightly with the reins… but if I did, is it her job to know where her feet are? I wonder if my feet were mud puddles if she would have missed. The weather was finally looking nice, and she did not have her mind on me, but was looking out at the pasture. Do they take aim or is it an accident when they step on us? You make an interesting argument here. Your point about knowing where her feet would be if a mud puddle or a foal were involved were dead on correct. Pretty much everyone who has ridden for long knows that a horse can go to great lengths to avoid touching their foot to an object or mud puddle if they are committed to NOT stepping there. My guess is that you are probably accurate when you say that she was distracted and didn’t have her mind on you and was looking out in the pasture. She should have some responsibility for paying attention to you and you should have some responsibility for paying attention to her. It sounds like you became aware that she was distracted…was that before or after she stepped on you? Part of your job is to notice the distraction and either correct her for it or realize that you need to be aware that the distraction could lead to ignoring you to some degree, which puts you at risk. 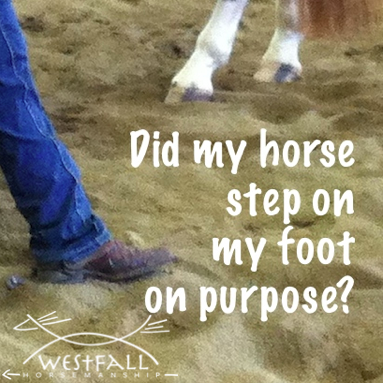 Most of the horses I have seen step on people were distracted and not paying attention to the person near them. This also says something about relationship between the handler and the horse. Be sure that your horse is respectful enough of you that even when worked up, invading your space is still not an option. Thankfully I cannot remember the last time that I was stepped on by a horse, probably because I am very aware (it is worth noting that being stepped on in the past has helped me become this aware:) I expect well trained horses to watch me but I am always watching them to know where they are at mentally. When I am around younger horses I take even more of the responsibility upon myself to use self defense and stay aware. Can a horse ‘take aim’ and step on you? I’m sure it is possible. I have seen them take aim and step on other things; tarps, dogs, and more…but I really hope my horse isn’t aiming for me! It is also worth noting that although horses can have excellent hoof awareness it doesn’t make them perfect. They are still prone to tripping and missteps not unlike their owners. I remember taking dance lessons with my husband Jesse. I would like to think he knows where his feet are in general…and that he wasn’t aiming for me…or was he? How often might Neurological Disease be a reason for a horse to not know where it’s feet are? I had an ornery appaloosa gelding named Chico. I had him for 11 years. I was 7 and he was 13 when my mom gave him to me. There were a few times that I got stepped on when I was younger and it was usually my fault for not watching where I put my feet. There was one time that I remember vividly. I was getting ready for a 4-H show and it was cold and raining out. I had to give Chico a bath and we only had well water, so it was cold as well. Chico was shivering and giving me the appaloosa glare (stink eye) and he very deliberately picked up his front left foot and stepped down on my foot. He then stood there and no matter how much I pushed him or waved my arms and yelled at him, he did his best to stay on my foot. He even cocked his back right foot like he was taking a nap. When he finally moved his foot, he didn’t pick it up like he usually did if he stepped on me. Instead he slid his hoof off my foot. Thankfully I was wearing my boots and only bruised my foot. I will forever remember that look of disgust on his face. No horse can glare like an Appy! After reading your last blog, it got me to thinking about my horse and how when brushing his belly with the shedding brush he raised his back foot and did a small kicking action? At first I ignored it and thought was it because he was ticklish, then I thought was there maybe a injury or sore spot? After careful inspection, I continued on making sure that I wasn’t brushing to hard or too soft as to bother him and he did it again! This time my instinct told me, he was testing me and this wasn’t a behaviour I wanted so I gave him a good slap and a growl and then went back to what I was doing. He was good after that, but the next brushing he did it again? Do I just keep listening to my instinct that this is bad manners and he is warning me that he is going to kick at me and if so maybe I should really get after him? I don’t want this to become worse? He is a young two year rescue horse that is friendly enough but I do see an aggressive side at times, example biting at me if not watching, rearing and striking at times on the lead (all of which I am patiently correcting or when need be getting after him) but things that if you were to get scared of he would tend to feed off that. AND my old mare used to line up the hose when I was washing her, she would step on it to cut off the water flow! ha ha my old stock pony would definitely line up your foot while saddling up the girth when we were kids! It taught me to place my feet in a certain way when saddling up. I think it is a stock horse thing. He had a whole bag of little tricks up his sleeve and that made him the best pony to learn on. Well I have to say MOST times my horse has’t stepped on me on purpose, he’s either jittery, distracted or someone else is handling him and he isn’t watching for me but the student that’s working with him. Exactly twice did he put his foot on me in what appeared to be with intent. BOTH times he did NOT put full weight on my foot and as soon as I hollered “hey” he moved. To me this meant he knew what he was doing. Years ago I owned a horse that was extremely adept at standing on the foot that was on the ground when you were mounting. As soon as you put your foot into the stirrup and were just about to climb on he would ever so carefully rock back and stand full on your foot. He had impeccable timing and did it every time if you didn’t know better . I initially thought it was an accident but he did his move with everyone and was a predicable a clockwork. Of course he was easy to stop once you figured out what he was up too but anyone new he would get. Other than when I am about to get in the saddle, I work around horses in steel caps. I handle horses on average 3 or 4 hours a day including babies. If they were to take aim, it’s futile & teaches them it achieves nothing. I actually rarely get stepped on. As a farrier, I can promise you that horses do, indeed, often “take aim” and step on you. I’ve watched horses put a hoof down on something (a rope, my stand, their owner’s foot) and refuse to move, even when being hit. Watching a horse move its foot off a rock or a rope or any other object makes it clear that they do, in fact, know when they have something besides dirt under their feet, even when their field of view doesn’t allow them to look at that object. Also, at a continuing education convention I went to, Dr. Robert Bowker spoke extensively about how controlled studies have shown that hooves have plenty of sensory ability, and a horse knows a great deal about what’s under his feet. Can being stepped on be an accident? Of course! But I’ve found it’s accidental a lot less likely than owners want to believe. Lol, I should have thought to ask a farrier! Professional hazard. I hope it was clear that I know horses have the sensory capability to know where their feet are (mud puddle and foal example)….I was just raising the question of if they take aim or are simply being lazy about where they step. It is clear that your experience says they take aim! I also , have a question about horse stepping issue. It’s a little off the beaten path, but … A few weekends ago my stallion, whose never shown signs of being aggressive ,at all, got very aggressive with one of my dogs. Now this particular dog is always in the paddock , usually waiting for Joker ( my horse) to drop a piece of carrot and my dog will pick it up and start eating it. My horse usually puts his nose on the backside of my dog, near his tail and nibbles him. Well, this wknd I’m speaking about , joker started following my dog ,which then made my dog walk faster . The whole time Joker had his nose glued to my dogs tail area… When my dog stopped we watched in horror as my horse seemed to trample my dog . Luckily the only damage was a broken toe in his paw. What was this ? Why this kind of reaction now after two years of no aggressiveness. I mean, I have three dogs and chickens and my horse will stop walking to wait to see where the other animals are before proceeding to make another step. I am lucky enough to work with horses as an acupressure practitioner and I have had the misfortune of having my foot stood on several times during my career, all for different reasons and usually totally in relation to why I was asked to visit in the first place i.e. balance issues, confidence issues etc. This week, I’ve been working closely with a horse that was given to me a couple of months ago because he bites when he is anxious, which is most of the time, and one of the reasons I was able to work with him confidently was because my feet (which are getting tender as years go by) never felt under threat – my face did on occasions, but not my feet. We made a big break through over the weekend where haltering is concerned and, for the first time since he arrived, I was able to put the halter on and take it off without him having a need to bite the rope or the halter. I was so pleased that he seemed to have overcome this huge emotional hurdle. I was even more pleased when he came trotting up to me the following morning and I took heart from this and reached for the halter to check his feet as he was lame when he arrived and the way he moves keeps changing as he gets better. However, I was caught off guard! Although, he was secure in our evening patterns it would appear he was not as confident in the mornings but, instead of going at me and the rope with his usual savagery, he stopped pushing on me and deliberately placed his foot, watching me as he did so, on top of mine and then leant on it. My take home message was; energy has to go somewhere! The dear little horse is learning some very basic lessons in life that seam to have passed him by when he was younger and he has learned some very peculiar coping mechanisms. I believe and hope that when he understands what is life all about under normal circumstance, he will no longer need these mechanisms to help him cope, and then my face and feet will be safe again! So, do horses step on their owners feet deliberately? I most certainly think they do sometimes but it is down to how well we listen and understand whatever it is they need us to understand. That IS an interesting question when put forth like that! One thing I do know is I have only One horse that I trust enough for my little grandchildren to groom…she is my best horse, and she doesn’t make those kind of “mistakes”. So looking at it from that point of view, if a horse can choose not too, then I think they can also choose to step on you as well. Something to think about. I have had horses that I believe did step on me on purpose. One would step on a persons foot then refuse to get off and even add more wight and sometimes turn her foot and kind of grind it into your foot. I am more aware now and teach my horses to be more respectful then I did back them. Last summer I had gotten back from a ride and unsaddled my horse and let him eat grass while I brushed him, as always. I was behind him when he stepped backwards on my foot. I screamed and sat down! He stepped forward and actually kept on going, into the barn, into his stall. He knew something bad happened and he went home! I don’t think he meant to step on it but knew he’d better get out of town. Stacey, what do we do if we know the horse was aiming for us? Today I was training my 3 year old mare to bow. Today was the first day and I was taking it slow. I got to the point where she would lift her foot and put her head down. I had decided to stop there but still had her full attention when I put her foot down… and she picked it up and put it on my foot while looking at me. My immediate reaction was a fist to her shoulder until she picked it up and a bit of lunging afterward so she understands I am still in charge, but this is the third time she has done it and she only does it after training. Thoughts? I also have not been stepped on in a long time because I also am very aware. Mostly because I sometimes wear inappropriate shoes to the barn, lol. I have, however, been “tail whipped” a few times and often wondered if that was on purpose. Thoughts?